at the Christmas Craft Fair in St Paul’s. 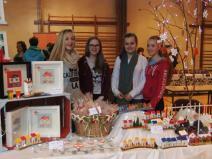 A great day was had at the bustling Craft Fair in St Paul’s on Saturday. Year 11 GCSE Art pupils made Ceramic decorations for sale and Alice provided seasonal Santa hot chocolates. Their display looked great and sales were made. 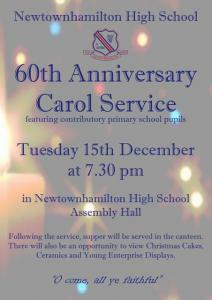 The pupils will set up a display of work at the Carol Service in school and you are all welcome to see their beautiful pieces and to make those final purchases for presents for Christmas. Miss Johnston would like to thank them for their hard work making and selling and for a successful, fun day. Pupils in South Armagh have recently benefited from the donation of an automatic egg incubator from the Poultry Industry Education Trust. The gift was organised by PIET Trustee, Mr Basil Bayne. The incubator will enrich the learning experiences of the pupils while also providing some fun during GCSE Agriculture and Land Use lessons. GCSE Agriculture & Land Use Studies is delivered in both Newtownhamilton High School and St. Joseph’s High School Crossmaglen to pupils from the western region of Newry and Mourne Area Learning Community. Newtownhamilton High School Principal Neil Megaw explains “This course is now in its third year and is delivered every Thursday morning as part of a shared education collaborative programme involving pupils from the 2 host schools and also pupils from St. Paul’s High School Bessbrook and Newry High School. The donation of the incubator has generated much interest amongst the pupils with eggs due to arrive on site soon. We are extremely grateful to Mr Basil Bayne from the Poultry Industry Education Trust for ‘hatching’ a plan so that our pupils can benefit from this impressive piece of equipment”. Our Year 12 pupils took part in the Sentinus Interview Skills Programme on Friday 13 November. Everyone involved made a tremendous effort and they all looked very smart in their professional dress. The morning session was delivered by Sentinus Trainer Mr Pat Jamison and focused on preparing the pupils for the interview process. After lunch, pupils were given the opportunity to be interviewed by experienced individuals from the local and wider community. Many thanks to Mr Pat Jamison and the 9 Interviewers for giving up their time to support this event. Thanks also to Vice Principal Mr A Cousins for co-ordinating the event. Pictured are Newtownhamilton High School pupils handing over their Christmas shoeboxes to Drop Inn Ministries Representative Mr Ian Liggett. The shoeboxes will now be sent to Belarus, Ukraine and Latvia where they will be distributed to children who live in orphanages, who are in hospital or whose lives are affected by poverty and ill health. 92 shoeboxes were donated by the pupils, parents and staff of Newtownhamilton High School while a further 75 were presented from Newtownhamilton Primary School. Many thanks to everyone who supported this very worthy cause. 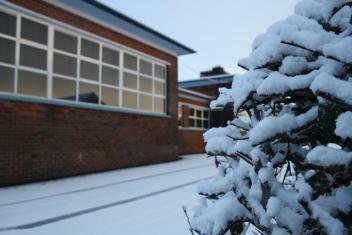 Now that we have entered the winter months, schools are required by DENI to remind parents and pupils about the procedures for emergency school closures (due to adverse weather etc). Deciding to close a school is not an easy decision for a Principal as it causes disruption to many individuals. However, the health and safety of all school stakeholders must be the key factor when making this difficult decision. 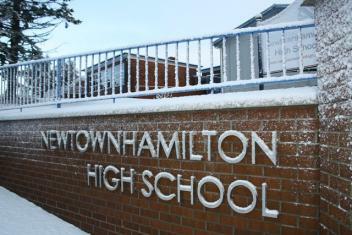 In order to find out if Newtownhamilton High School is closed, parents can tune into BBC Radio Ulster, visit the BBC NI website, or check for updates on our website and Facebook page. Parents will hopefully receive a text from our school messaging service. The aim is to make an early decision (usually before 7.30am) if possible. Reminder that shoeboxes for the Drop Inn Ministries Christmas 2015 Shoebox Appeal need to be sent into school on or before Friday 13 November. The local and wider community once again came out in force last night (Thursday 5 November) to support our annual Prize Night that celebrated the successes of the 2014/15 school year and in particular the class of 2015. A packed assembly hall was in attendance as the Chairman of the Board of Governors Mr Ivan Bingham welcomed special guests Miss Michelle McIlveen MLA and Mr David Cargo (Board Member of the recently established Education Authority). Mr Bingham was also delighted that Miss McIlveen’s successor as Chairperson of the Education Committee Mr Peter Weir MLA was also in attendance. Mr Cargo presented the Key Stage 3 awards while Miss McIlveen presented Key Stage 4 certificates and prizes and also delivered the address which centred on the need for young people to make the most of their opportunities. The recipient for the G Mullan Cup for Academic Achievement was presented to Alex Smyth for achieving an outstanding 9 A* and 2 A GCSE grades while Peter Falloon collected the McNiece Cup for the Best All Round Pupil on the Vocational Enhancement Programme. Principal Neil Megaw congratulated all prize winners and announced that an incredible 88% of pupils achieved 5 grades at A*-C in GCSEs or equivalent, while 65% achieved 5 GCSE grades at A*-C including the all-important GCSE English and GCSE Maths. Mr Megaw paid “tribute to the excellent work of everyone involved”. Special mention must also go to the choir and musicians for their performances and also to the joint effort of staff, School Association Members, pupils and canteen staff for providing a magnificent supper. To conclude, it was an excellent evening which was very fitting to acknowledge the achievements of the class of 2015. Year 9 pupils and English teachers, Mrs Graham and Mrs Robinson, enjoyed a trip to Iveagh Movie Studios in Banbridge to watch the acclaimed ‘The Fault in Our Stars’. This film was screened as part of the Into Film Festival 2015. This festival celebrates films and their educational value by screening adaptations of novels. Yr 9 study a ‘Reading Film’ unit of work and this film certainly provided them with educational and emotional value. Many tears were shed as they watched a moving love story unfold between two remarkable teenagers as they embarked on the adventure of their brief lives. This was certainly a memorable movie experience.